Not making the amount of money you'd like to earn in your business? Constantly putting in tons of effort but not seeing much of a return at all? You have some work to do on your money mindset! In this episode of Rebel Boss Ladies, we are joined by Krista Dickson! 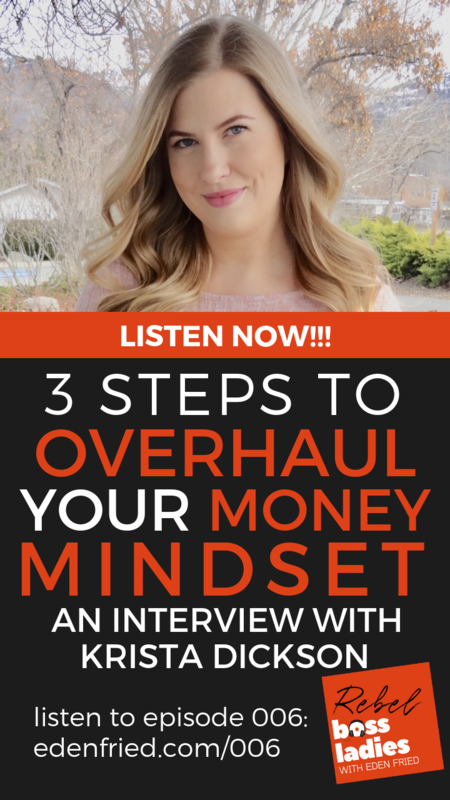 Krista is going to give you her 3 step system to improve your money mindset and earn the kind of money you've been dreaming about in your business. With just a little “woo” and a lot of positivity, you can change your relationship with money in a really powerful way. Skeptical? No worries. This is a short and sweet episode, so why not give it a listen? What do you have to lose? Krista Dickson is a soul-based business coach for ambitious female entrepreneurs who are ready to ditch the hustle, embrace ease, and manifest #allthethings. She combines energy & mindset work with business strategy to help her clients and students create their dream businesses and lives.